Today’s post is so simple, it’s almost not a recipe. It is really good, however, and it upgrades your basic packet of ramen to a comforting meal deserving of repeat performances on the menu. This one is probably the fastest one this week, so hang on to it for the nights when the dinner struggle is real. Husband-face and I grew up eating ramen. Nothing special; just heat water, toss in seasoning and noodles, and eat. Like most people, we ate lots of it when the food budget was tight or we wanted a fast meal. We moved to Japan and had our first real bowls of ramen, and it blew us away. It was simple yet complex, warm, delicious, and nothing like the packets of our childhood. It was also a very involved process to make from scratch, so we pretty much stuck to enjoying it at ramen houses. Of course after moving away, the simple ramen packets didn’t quite hit the spot anymore, but we didn’t have a ramen house to go to for our fix. That’s when we started “hacking” our ramen and making it more of a substantial meal. We surely aren’t the first to do this, and won’t be the last, but I hope to add you all to the list of “ramen hackers”, and I hope you’ll find it to be satisfying and really tasty. Heat 6 cups of water in a large saucepan over medium heat. Add in ramen seasoning packets, garlic, fish sauce, soy sauce, chili paste, and sugar. Bring to a rapid simmer. Break the noodle blocks in half and add to the broth. Cook until softened, about 2-3 minutes. Divide among bowls and top with shredded chicken, green onions, cilantro and spinach. Serve with hard boiled egg halves and add additional chili garlic paste for heat, soy sauce for more salt, or a little raw sugar for sweetness. As always, change up the recipe to feature your favorites using different flavors of ramen, different meat, and different veggies. Shredded cabbage, carrots, shrimp, pork, beef or tofu will all work well here. 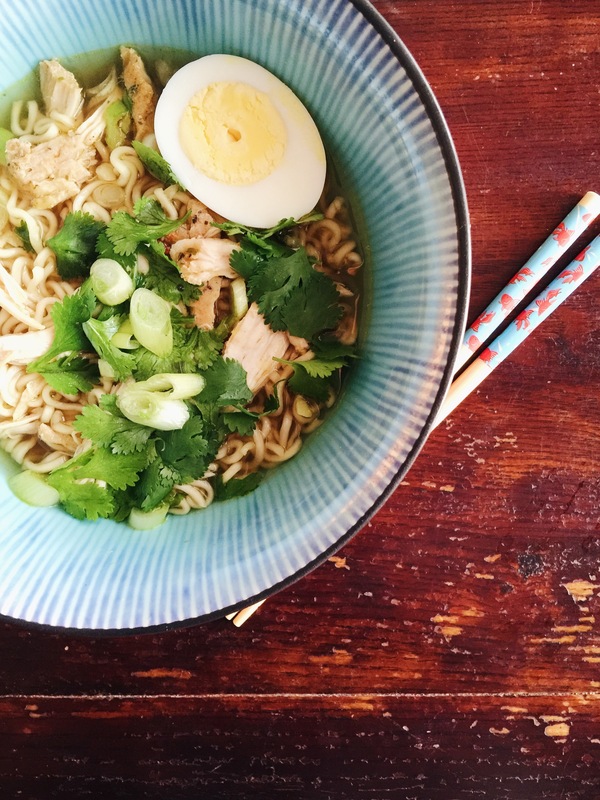 While this may not hold up against a bowl of authentic ramen, it holds up against a busy day and hungry people. It’s saved dinner several times in my house, and I hope it does the same for yours.